A very large expanded flat may have ended at the last low. 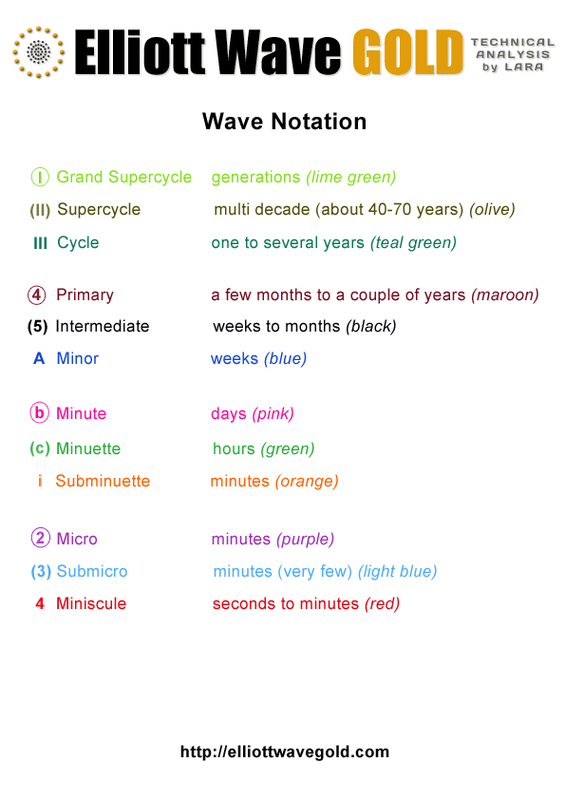 This is labelled cycle wave II. Within cycle wave II, primary wave B is within the normal range of up to 1.38 times the length of primary wave A. Primary wave C moves below the end of primary wave A avoiding a truncation and a rare running flat. 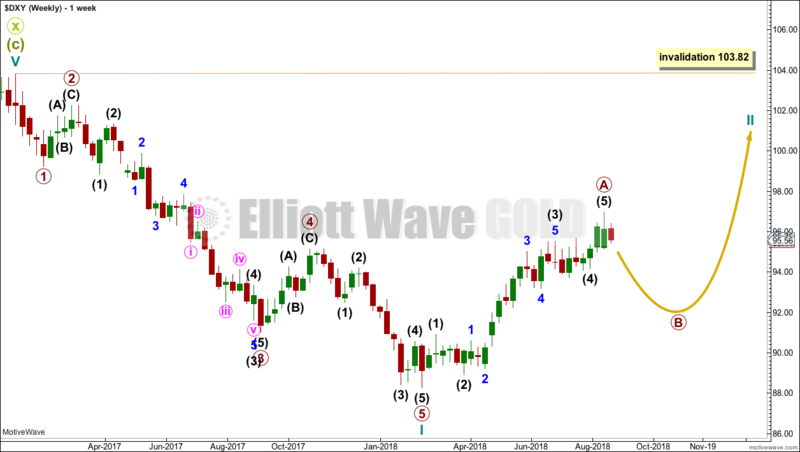 If this part of the wave count is correctly labelled, then the bear market may be over for XOP. 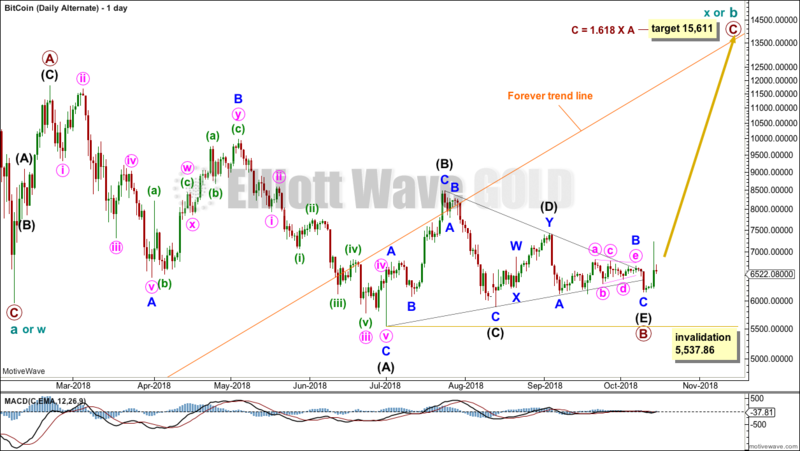 A three wave structure moving lower indicates the larger trend may be upwards. The alternate idea would be that this expanded flat may be only wave W of a double flat or combination; the correction would continue sideways for a few more years. 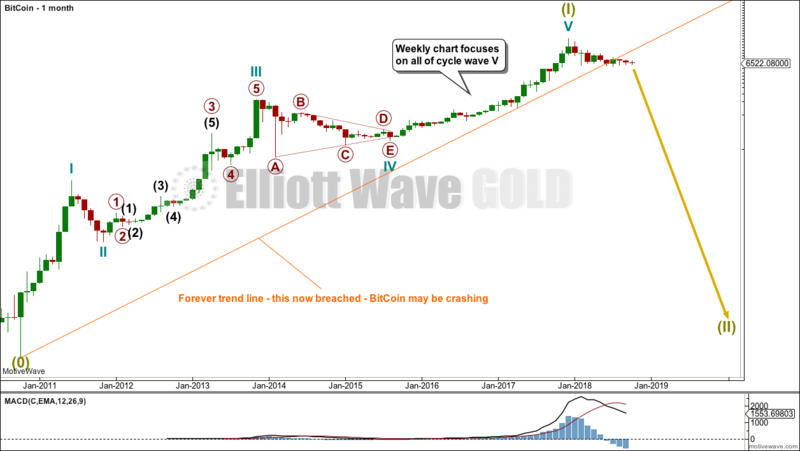 From the end of cycle wave II, a five up may have completed. This is labelled primary wave 1. 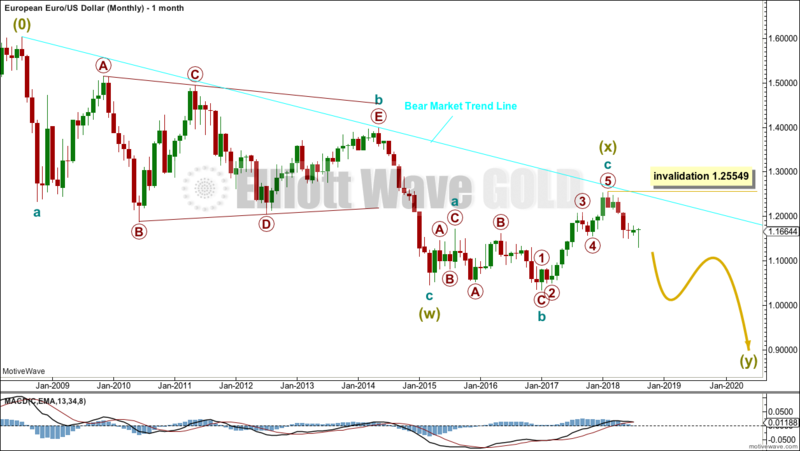 Primary wave 2 may be an incomplete regular flat correction. Regular flats usually have C waves that end slightly beyond the end of their A waves. Intermediate wave (C) must subdivide as a five wave structure. So far minor waves 1 and 2 may be complete. Minor wave 3 may only subdivide as an impulse. 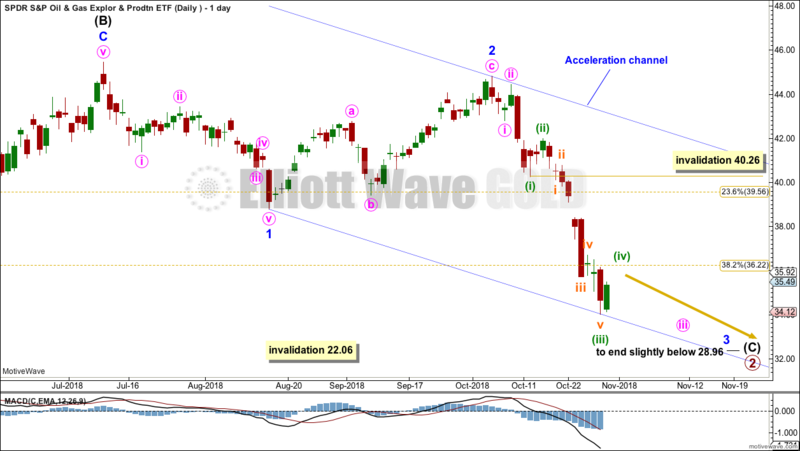 Strong downwards movement last week fits expectations for a third wave. 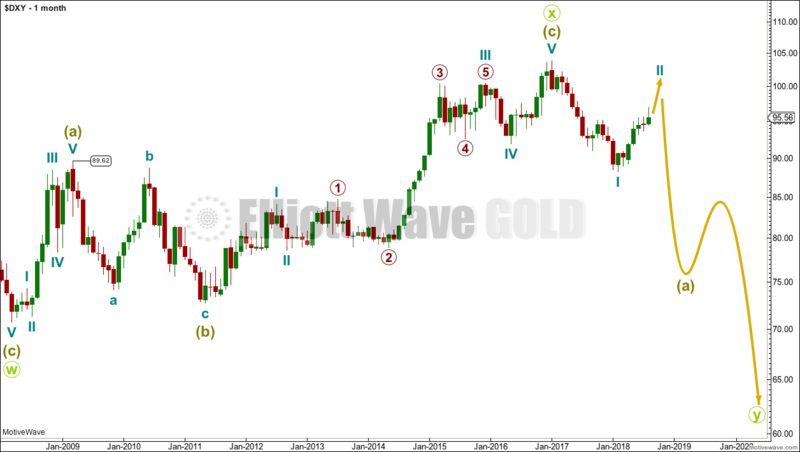 Primary wave 2 may not move beyond the start of primary wave 1 below 22.06. Minor wave 3 exhibits strength. It looks like a third wave. Within minor wave 3, minute wave i and ii may be complete. Within minute wave iii, minuette waves (i), (ii) and now (iii) may be complete. 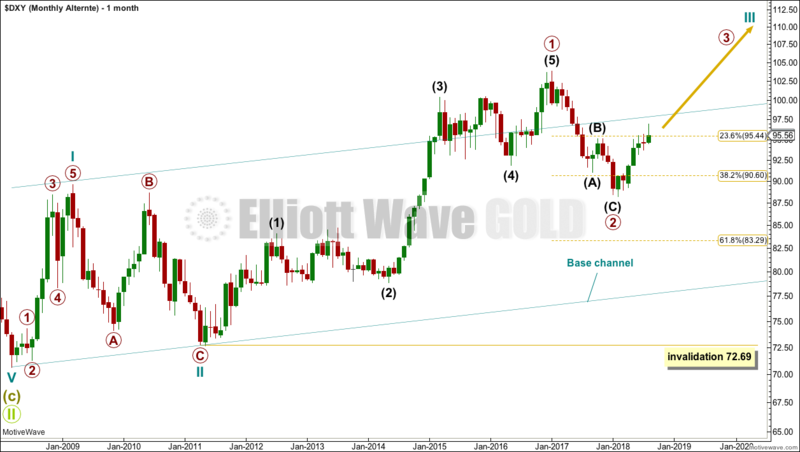 Minuette wave (iv) may not move into minuette wave (i) price territory above 40.26. 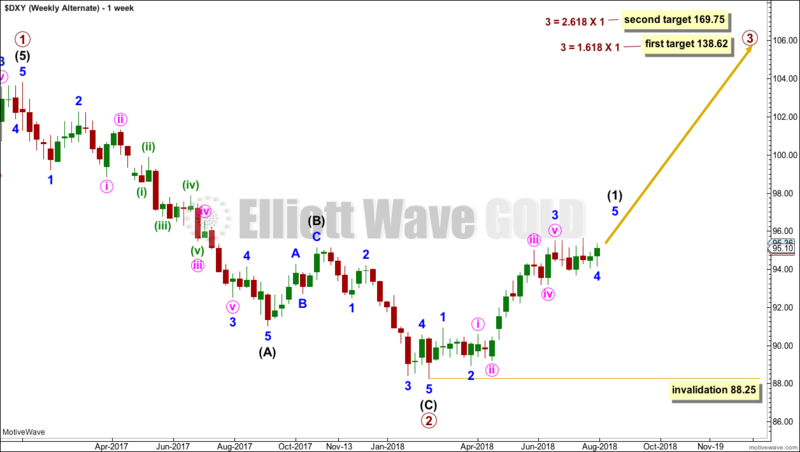 Overall, this wave count expects more downwards movement to at least slightly below 28.96. This target may be met in another few months. 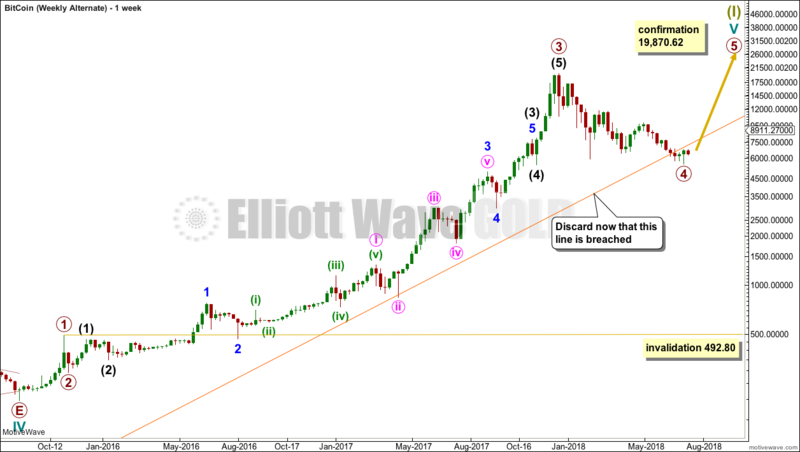 Along the way down, another consolidation to last about one to two months for minor wave 4 may be expected. 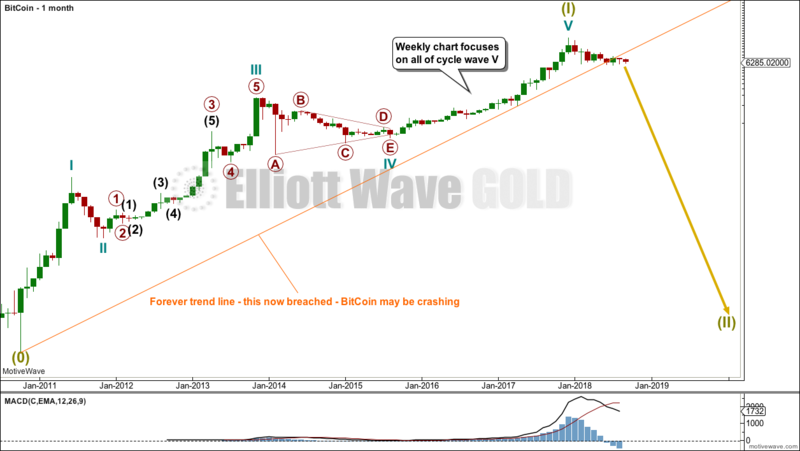 When it arrives, minor wave 4 may not move into minor wave 1 price territory. Draw an acceleration channel about downwards movement. Draw the first trend line from the low labelled minor wave 1 to the last low, then place a parallel copy up on the high labelled minor wave 2. As price keeps moving lower, keep redrawing the channel. 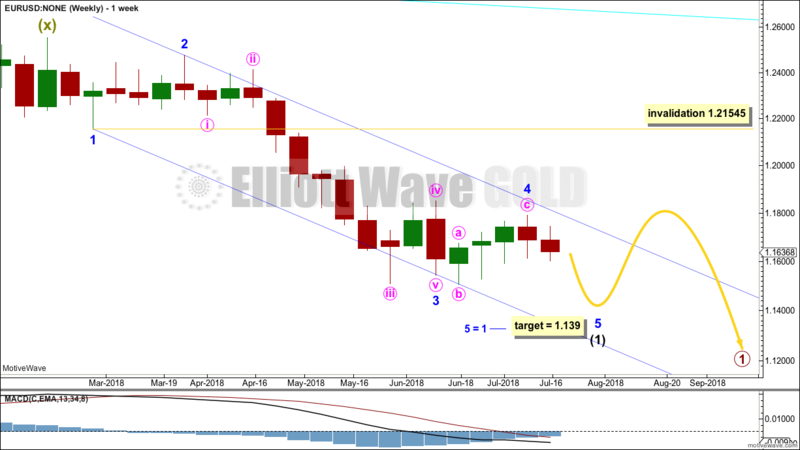 When minor wave 3 is complete, then the upper edge of this channel may provide resistance for minor wave 4. 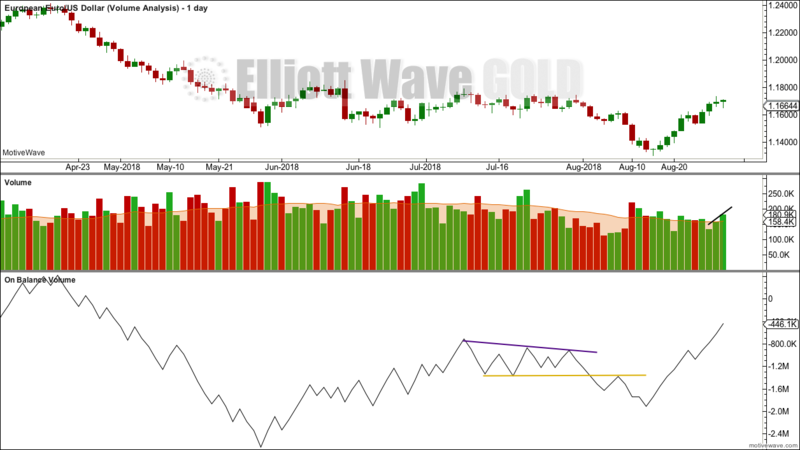 Price consolidated, with support about 39.65 and resistance about 45.00, from the 7th of May 2018 to the 22nd of October 2018. 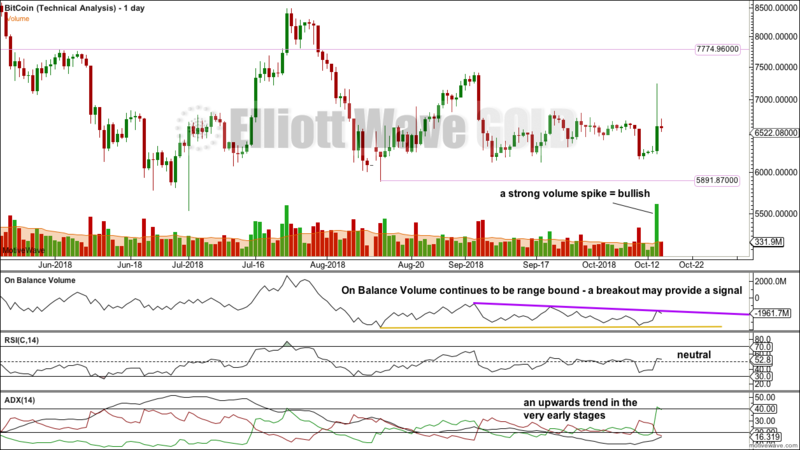 Price broke out from the consolidation zone on the 22nd of October on a strong downwards day. 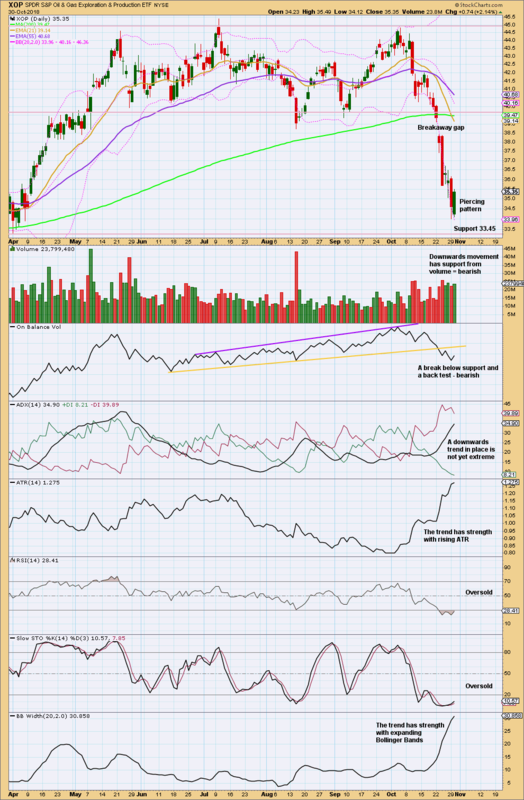 The following day gapped lower on another strong downwards day with support from volume, creating a breakaway gap. This looks like a classic downwards breakout. If price bounces up here to test resistance, then expect strong resistance at the breakaway gap at 39.10. 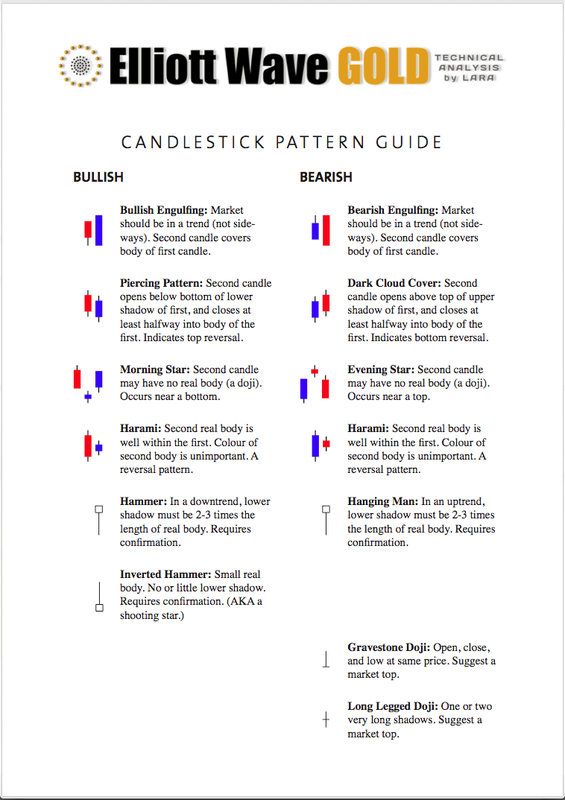 Currently RSI is oversold and there is a bullish candlestick pattern. 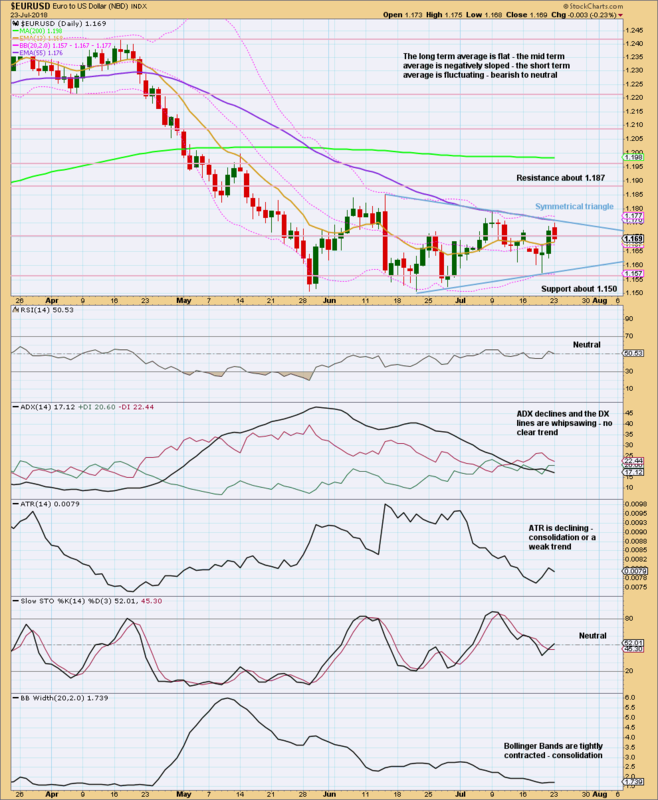 Expect a small bounce or consolidation here. The target is about 32.99. Published @ 02:37 a.m. EST. 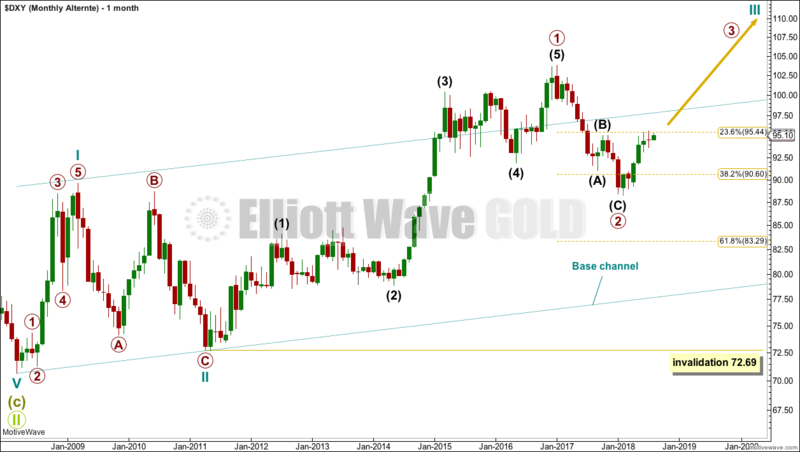 Last analysis expected a little more upwards movement at the daily chart level to complete primary wave A. This is what has happened. 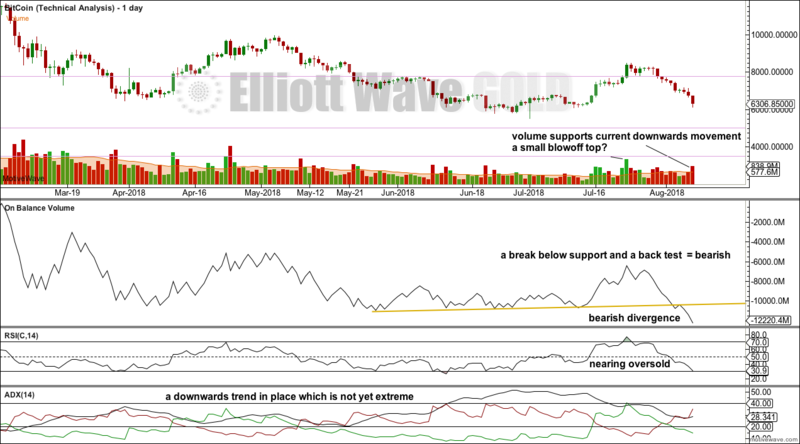 Summary: A pullback here or a time consuming sideways consolidation may develop for primary wave B. 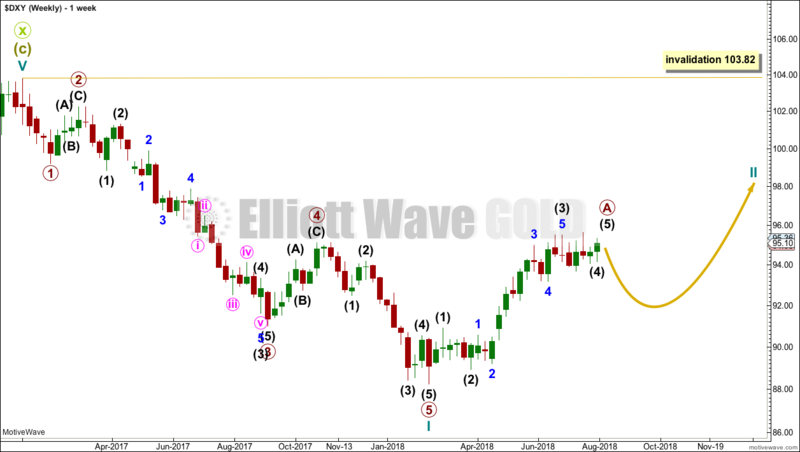 Thereafter, the upwards trend may resume for primary wave C.
The wave count begins at 0. 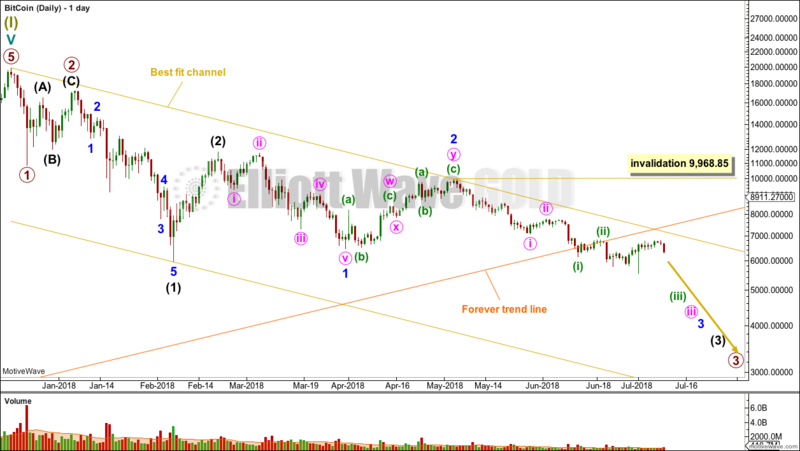 A huge double zigzag may be continuing lower. 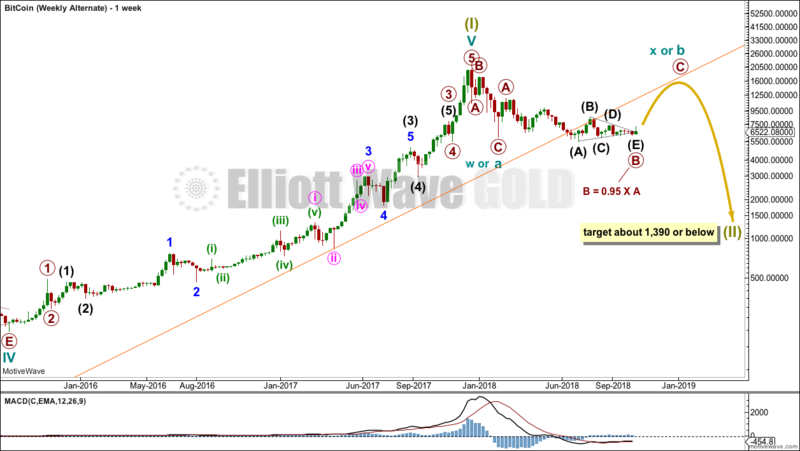 Downwards movement from the high in January 2017 cannot be a fourth wave correction within an ongoing impulse higher because a new low below 89.62 would be back in first wave price territory. That indicates the last big wave up may be a completed three, and for that reason this is my main wave count. 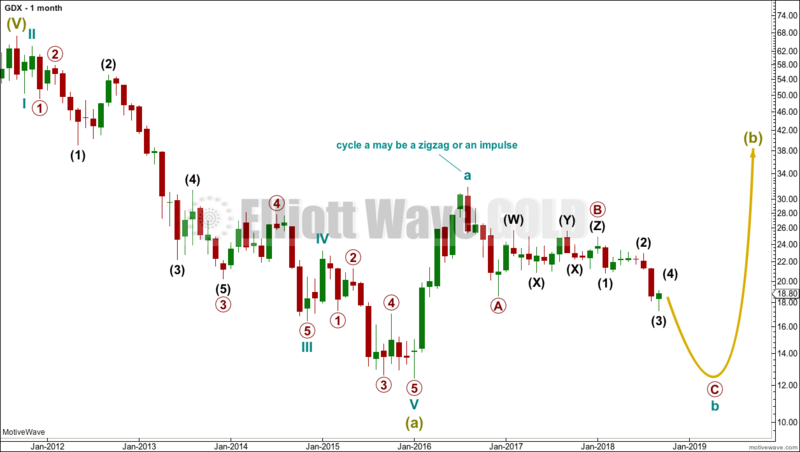 Cycle wave I downwards fits very well as a five wave impulse. This may be reasonably expected to be followed by a three wave structure upwards. 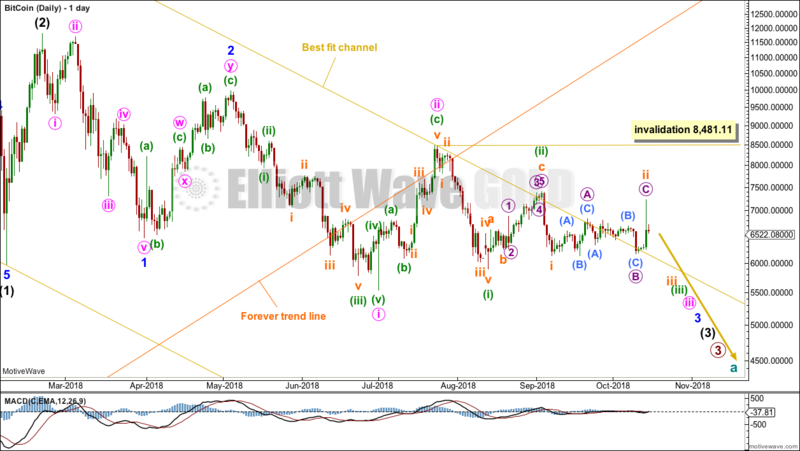 For the USD Index, historically the first second wave correction within a new trend is usually extremely deep, about 0.80 to 0.90 of the first wave it corrects. It would be typical here to see Cycle wave II reach to 0.80 or deeper of cycle wave I. 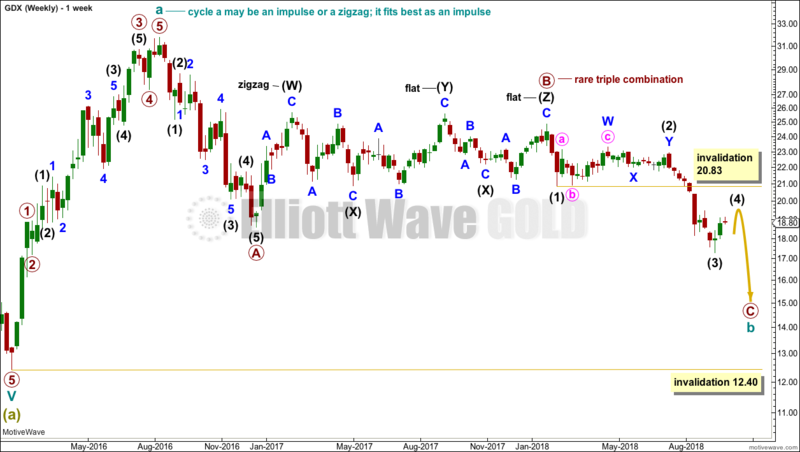 If cycle wave II is beginning with a five up, then it may be unfolding as a zigzag, which is the most common type of corrective structure. 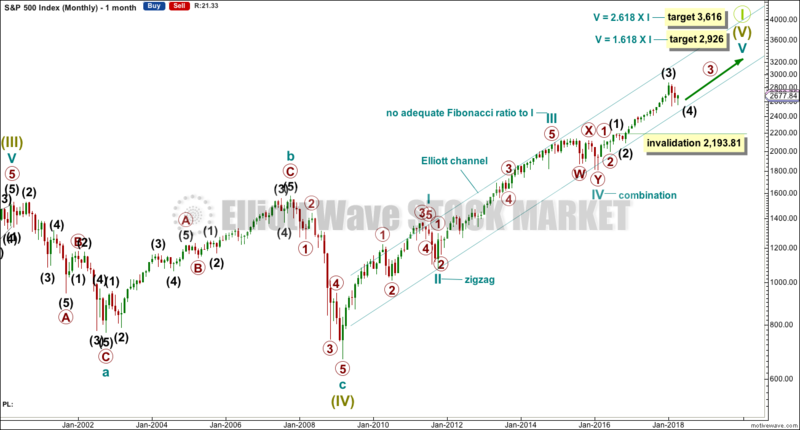 Primary wave A may now be a completed five wave impulse. Primary wave B may now begin. 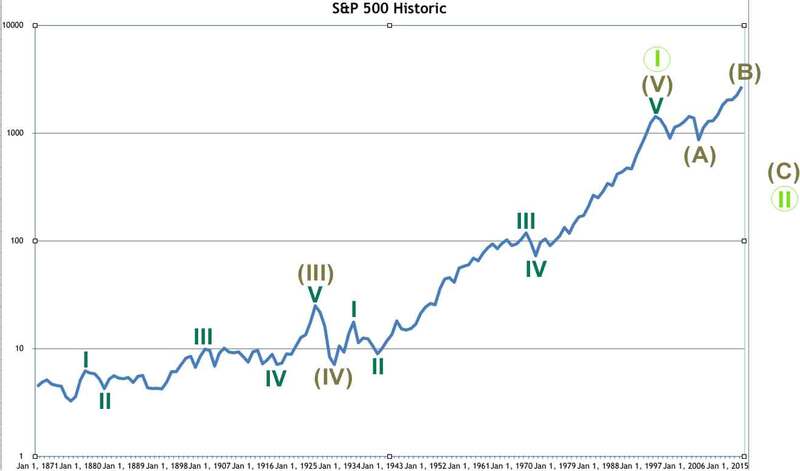 Primary wave B may last anywhere from a Fibonacci 13 up to a Fibonacci 55 weeks. 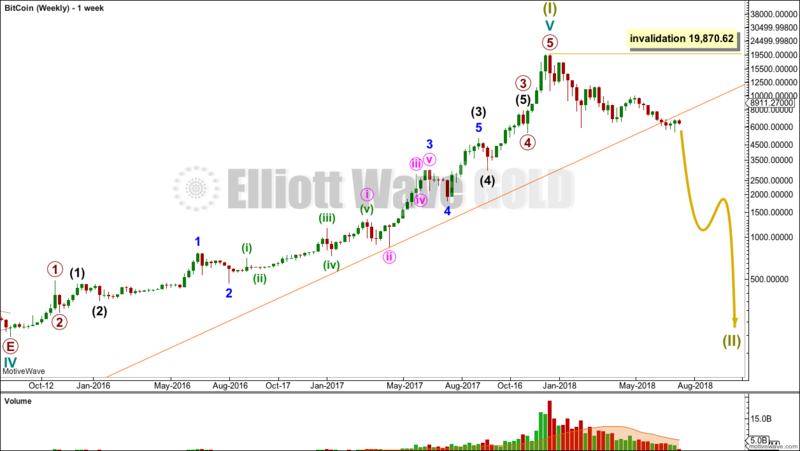 It may be either a relatively quick sharp pullback as a zigzag, or a more time consuming large sideways consolidation as a flat, combination or triangle. 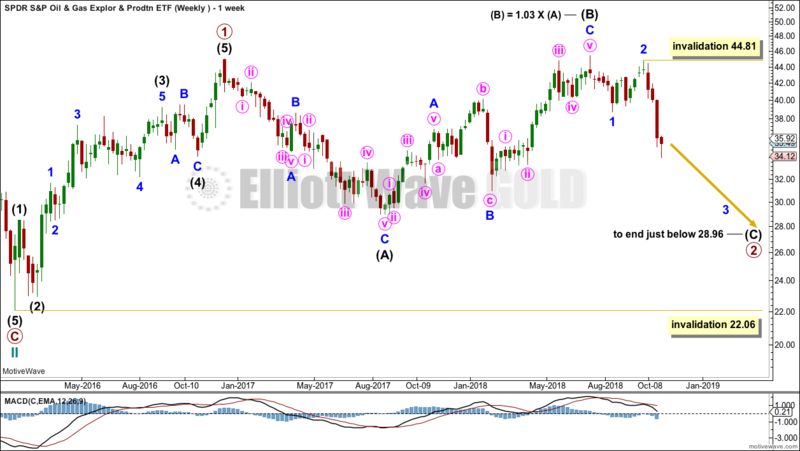 When primary wave B is complete, then the upwards trend may resume for primary wave C, which may end reasonably close to 103.82 but not above this point. 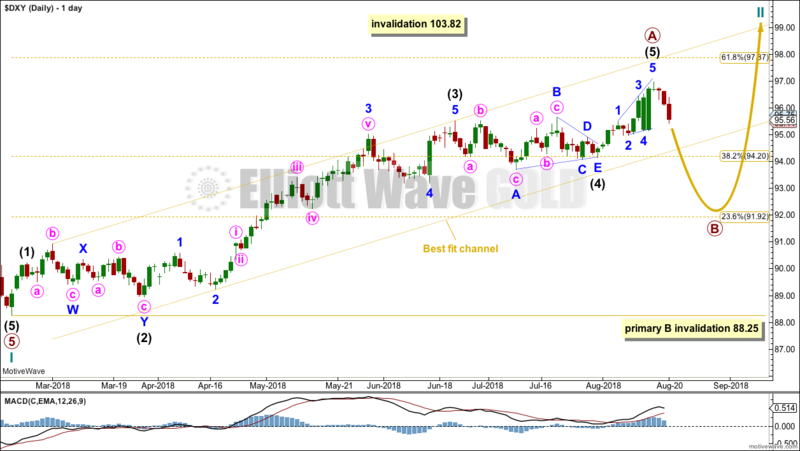 Cycle wave II may not move beyond the start of cycle wave I above 103.82. Primary wave A fits very well as a complete five wave impulse. So far primary wave A remains contained within a channel. 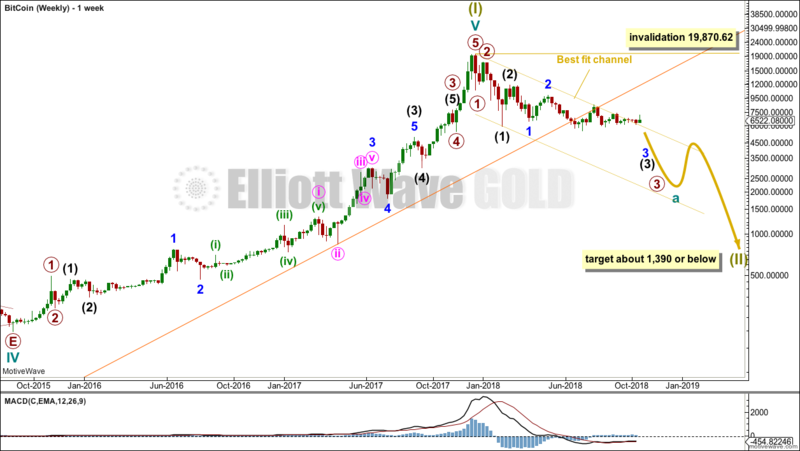 When price breaks out of the lower edge of the channel, then that would provide confidence that primary wave A is complete and primary wave B may have begun. 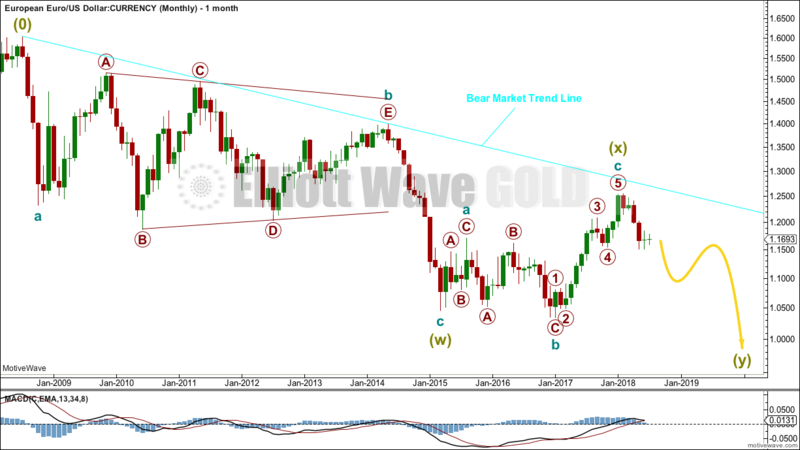 Primary wave B may not move beyond the start of primary wave A below 88.25. Primary wave B may be any one of more than 23 possible corrective structures. It may be choppy and overlapping as a combination, flat or triangle, or it may be a more brief sharp pullback as a zigzag. 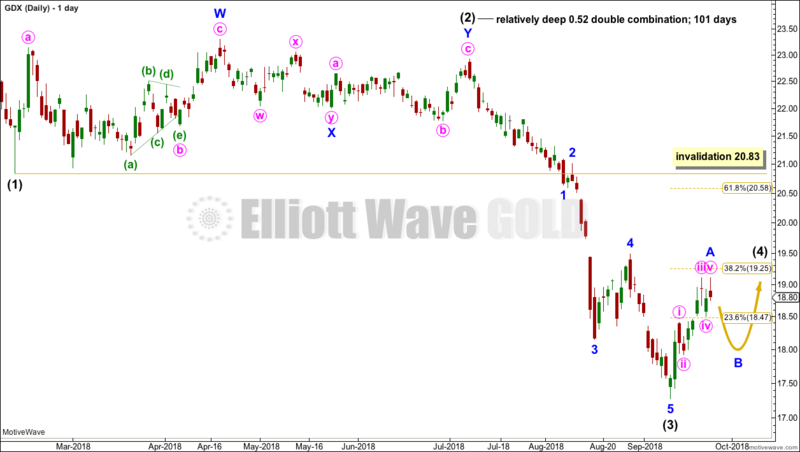 A single zigzag down to the last major low may still be complete. 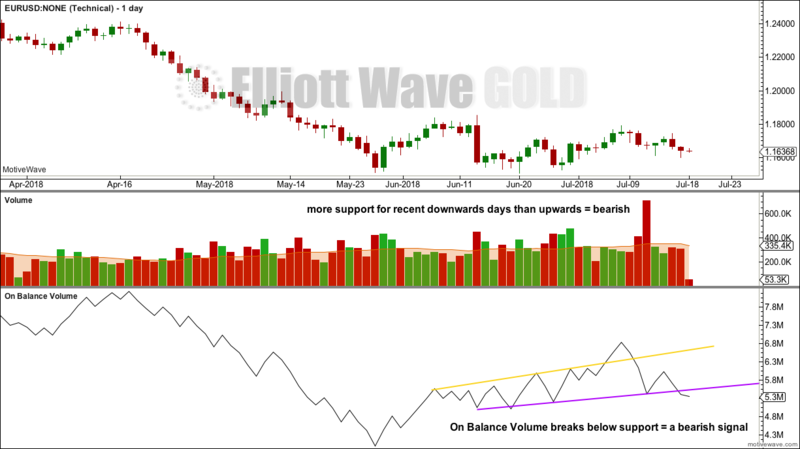 A new upwards trend may continue. So far there may be two overlapping first and second waves. 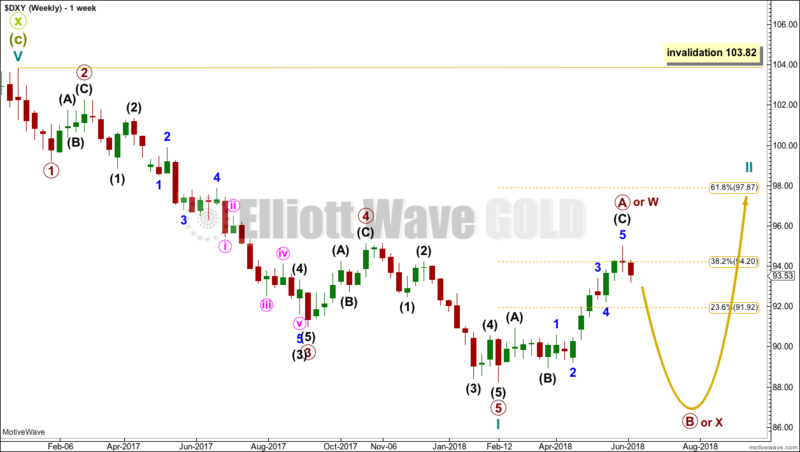 Primary wave 2 may not move beyond the start of primary wave 1 below 72.69. 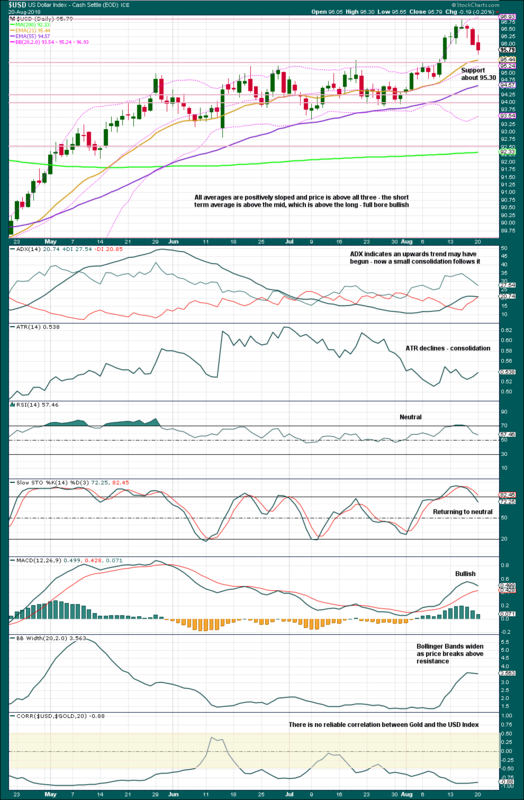 Primary wave 2 should find strong support at the lower edge of the teal base channel if it gets down that low. 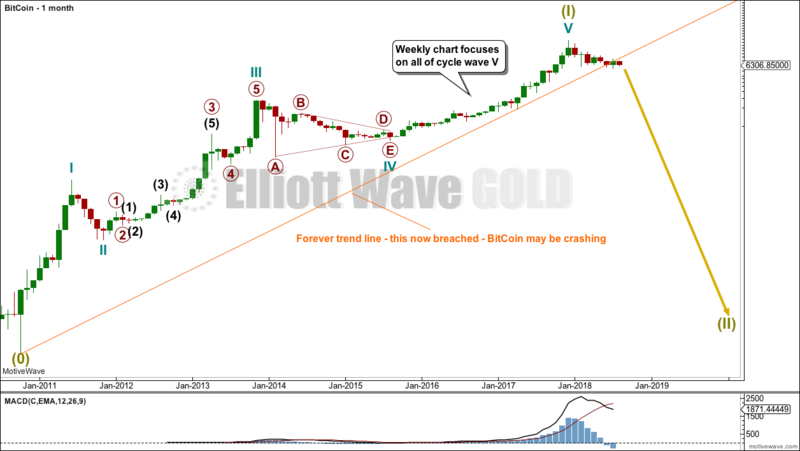 Primary wave 2 may be a complete zigzag. However, this wave down can also be seen as a five and primary wave 2 may yet continue lower. 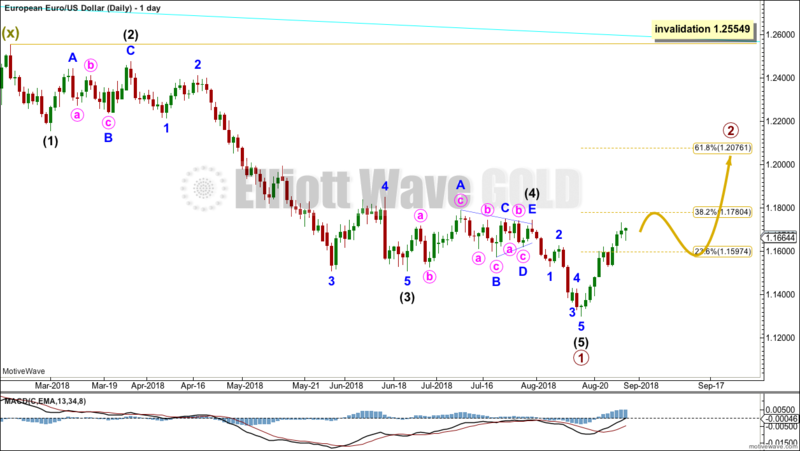 This bullish wave count sees the last wave down as a completed zigzag. 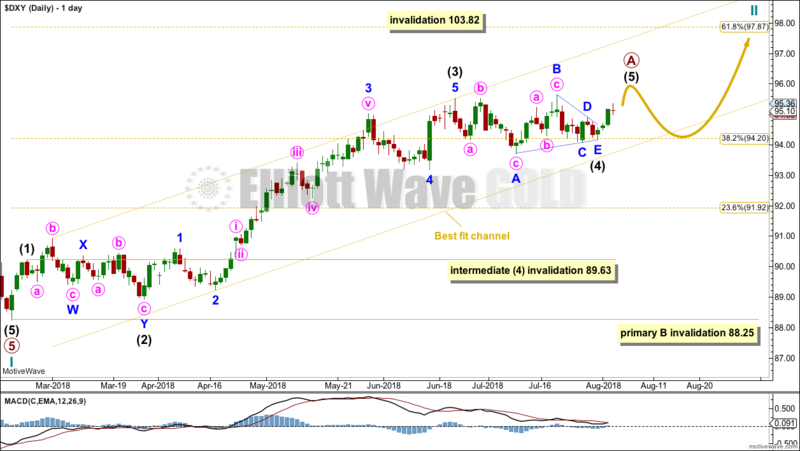 If this is correct, then within primary wave 3 no second wave correction may move beyond its start below 88.25. Last analysis noted the consolidation with resistance in a zone about 95 to 95.45. Price broke above resistance, and now downwards movement may be a backtest of support at prior resistance. 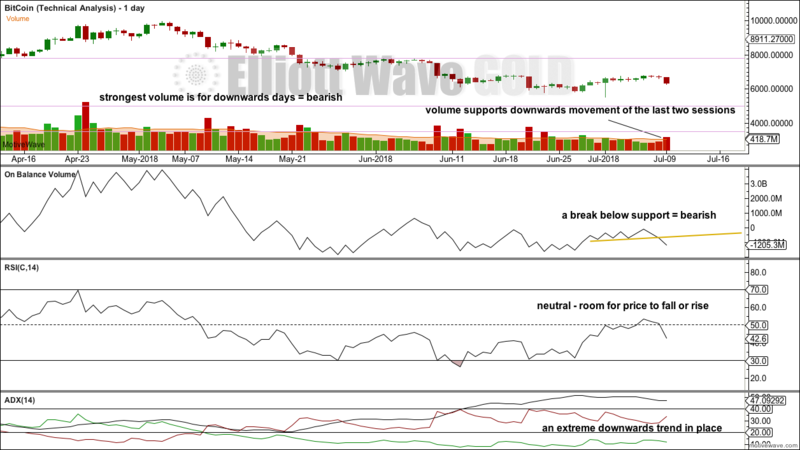 If support holds here, then expect price to bounce up and move higher. Published @ 01:23 a.m. EST. 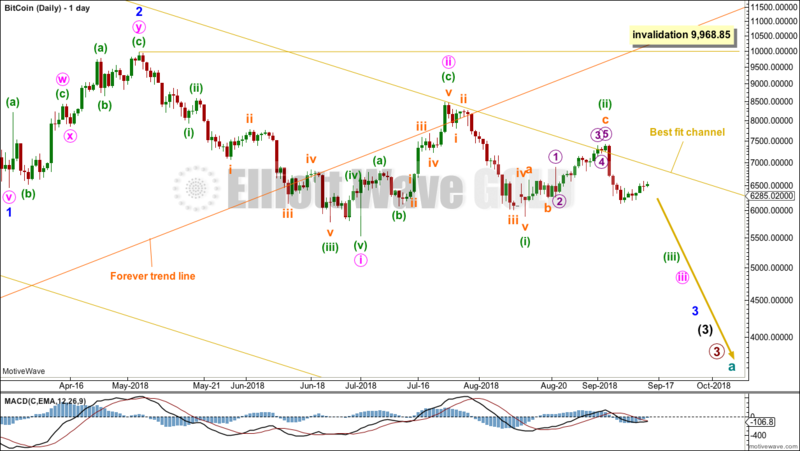 Last analysis on the 10th of June expected a deep correction for a B wave. Price has mostly moved sideways, and has now formed a fairly well defined consolidation zone. A correction has developed, but at this stage it is not deep. So far upwards movement has developed a little more since last analysis. This now looks like an almost complete five up. When primary wave A is a completed five wave impulse, then primary wave B should begin. So far primary wave A fits very well as an almost complete five wave impulse. 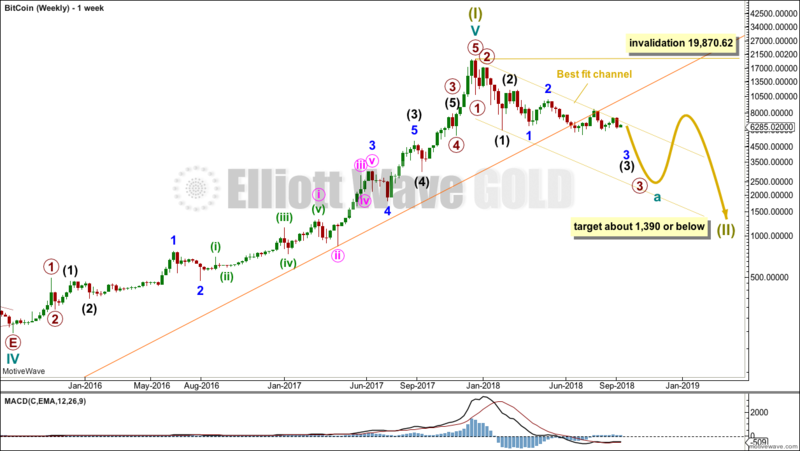 There is excellent alternation between the double flat correction of intermediate wave (2) and the triangle of intermediate wave (4). 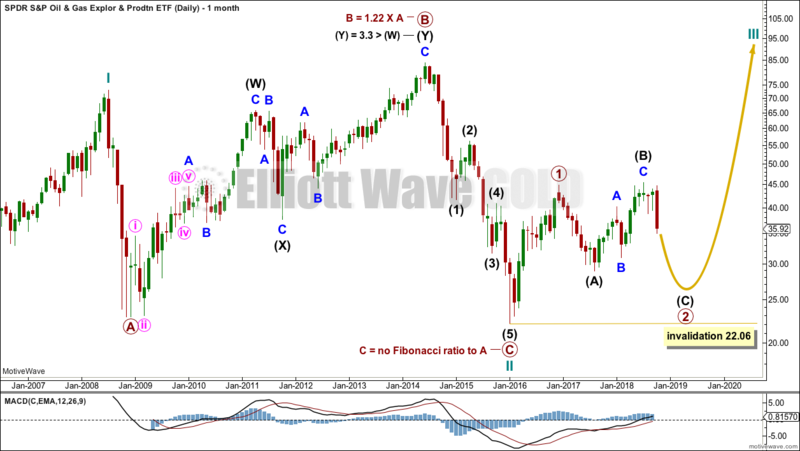 There is no adequate Fibonacci ratio between intermediate waves (1) and (3). 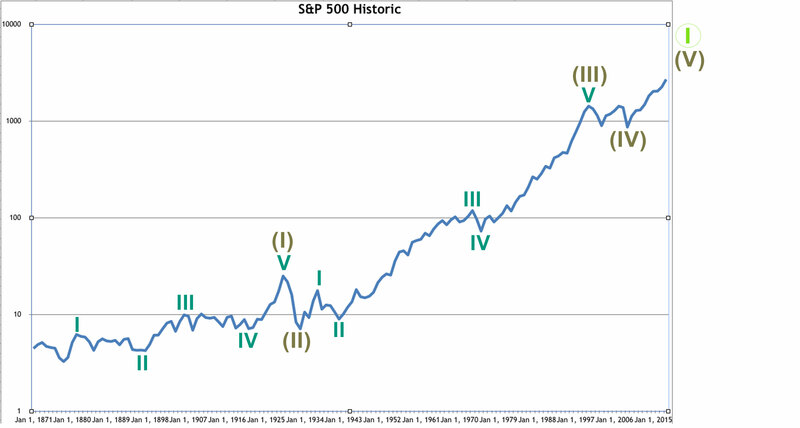 Within intermediate wave (3), there are no adequate Fibonacci ratios between minor waves 1, 3 and 5. So far primary wave A remains contained within a channel. 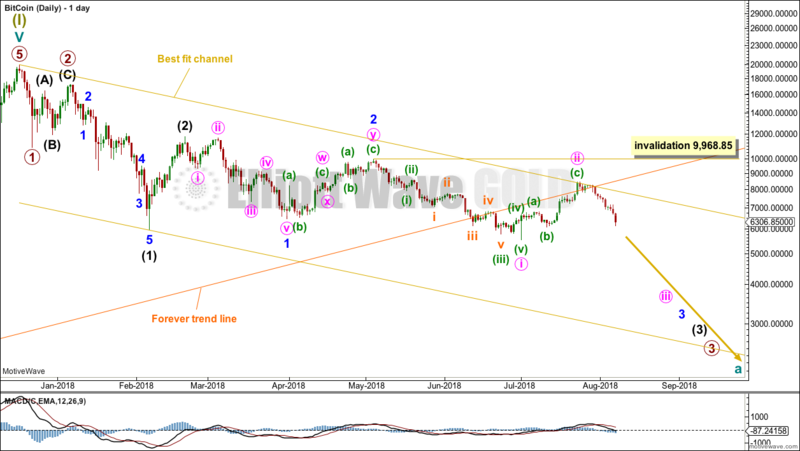 When price breaks out of the lower edge of the channel, then that may be an indication that primary wave A is complete and primary wave B may then have begun. 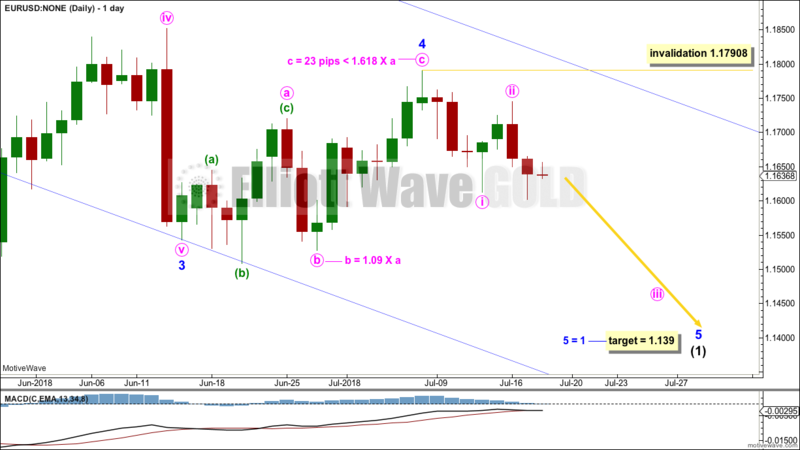 While primary wave A looks incomplete, intermediate wave (4) may not move into intermediate wave (1) price territory. When primary wave A could be complete, then the following correction for primary wave B may not move beyond the start of primary wave A. 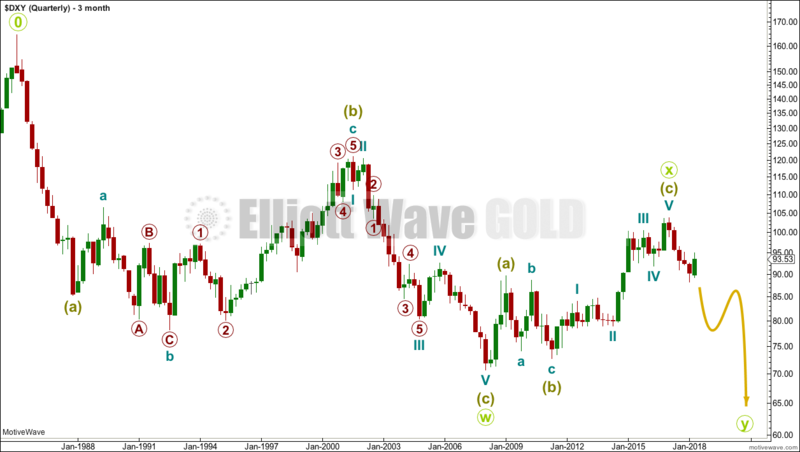 Primary wave B may be any one of more than 23 possible corrective structures. It may be choppy and overlapping as a combination, flat or triangle, or it may be a more brief sharp pullback as a zigzag. It may be expected to last anywhere from about 4 to 8 months. 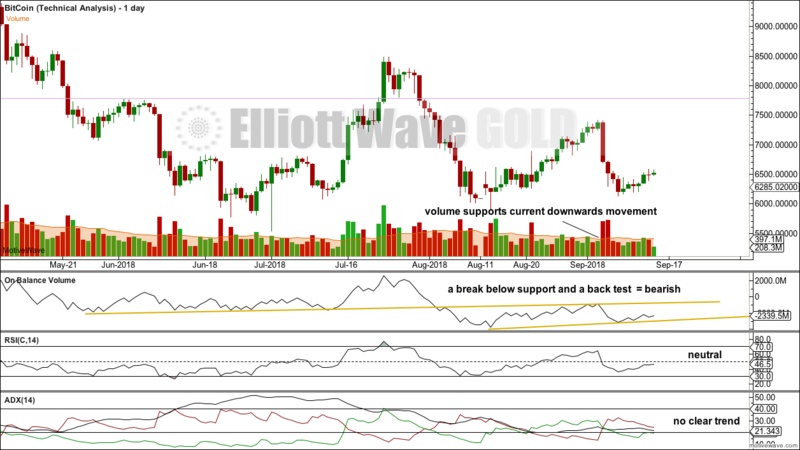 Price is consolidating with resistance in a zone about 95.00 to 95.45 and support in a zone about 93.45 to about 92.85. 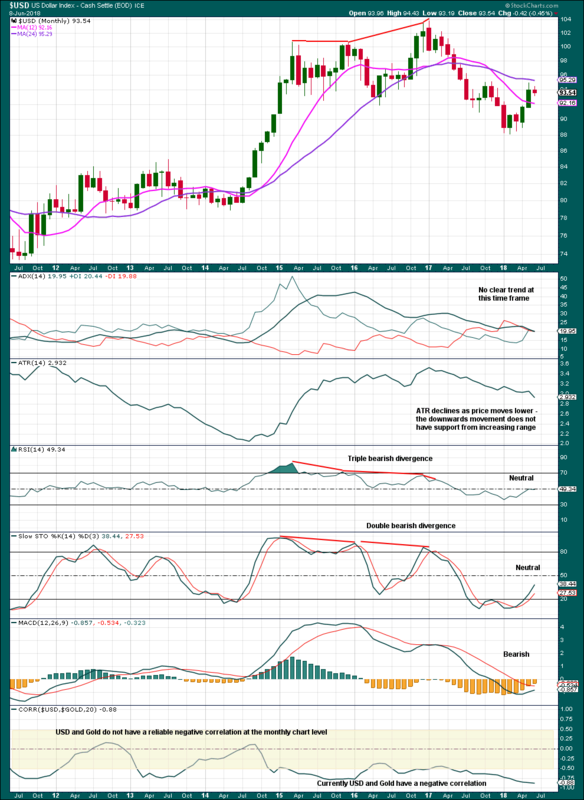 Unfortunately, neither StockCharts nor BarChart provide volume data for the USD Index. If they did, then the direction of the day with strongest volume would be an indicator of the most likely breakout direction from the consolidation. Published @ 08:53 p.m. EST on 4th August, 2018. Last analysis presented a scenario that Bitcoin was most likely in the early stages of a collapse while price stayed below 13,031.04. This still remains the case today. Summary: A clear breach of a support line, which has seen all price action above it until this point, is a strong indication that Bitcoin is bearish. 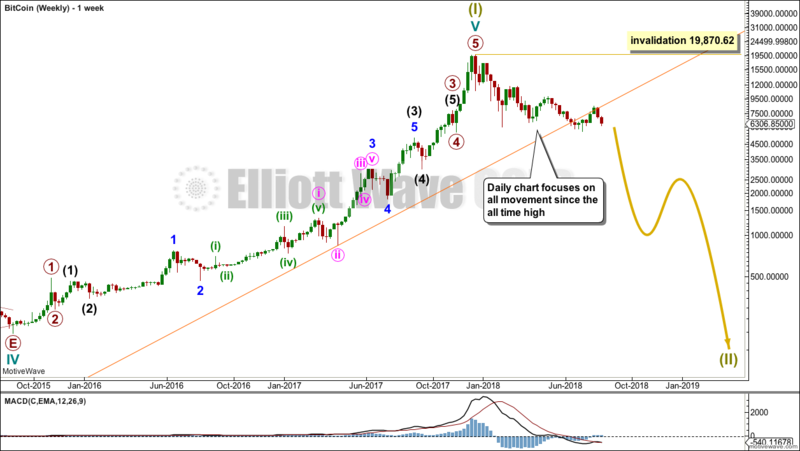 At this time, Bitcoin may be beginning a third wave down at five degrees; if it is, then it should start to exhibit a strong increase in downwards momentum. 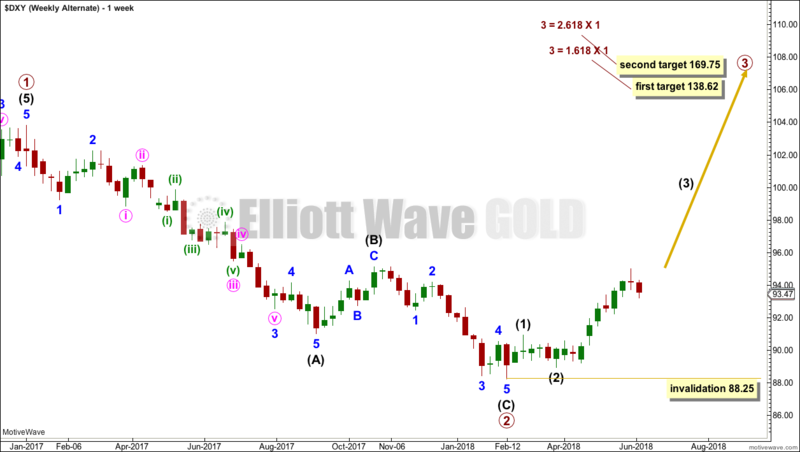 I am unable to find reasonable Fibonacci ratios within this wave count. It appears that Bitcoin may not exhibit Fibonacci ratios very often between its waves, so this makes target calculation impossible. Classic technical analysis will then be used to identify a high in place. What is very clear from this chart is that Bitcoin is in a classic bubble. This looks like an even larger bubble than the Tulip Mania. The only thing about which I am certain is that this bubble will pop and Bitcoin will collapse. What is uncertain is exactly when it will crash. 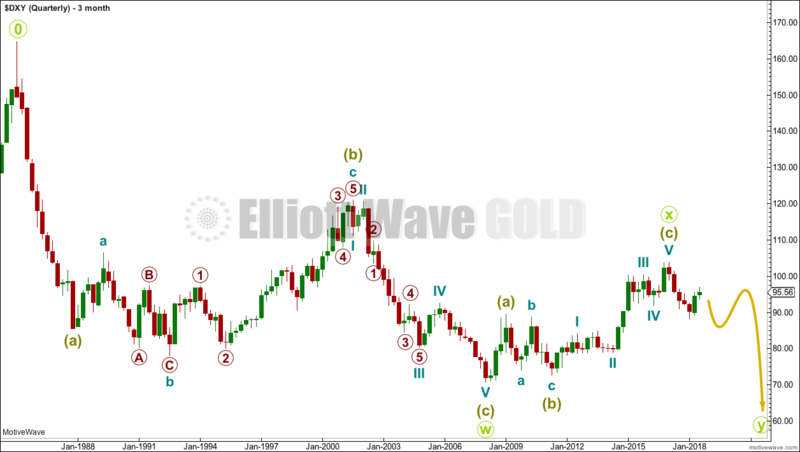 For that question to be answered Elliott wave analysis may be helpful. 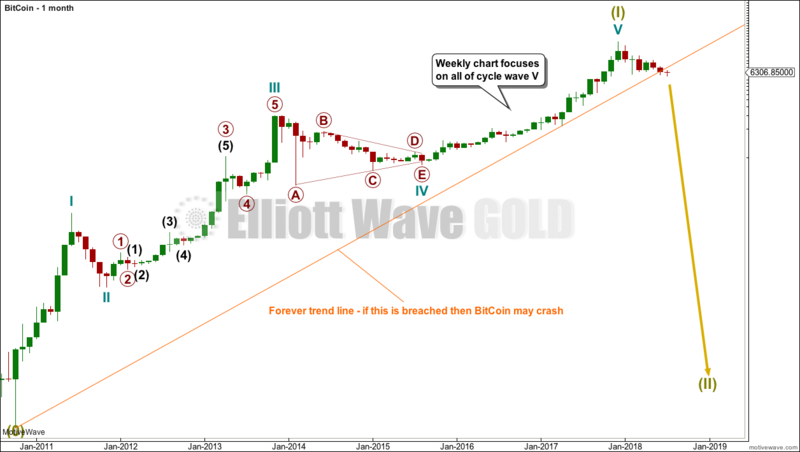 Now that the Forever trend line is breached some confidence may be had that Bitcoin may be crashing. If Bitcoin is in the early stages of a huge crash, then a five down structure should develop at the daily chart level. This would still be incomplete. 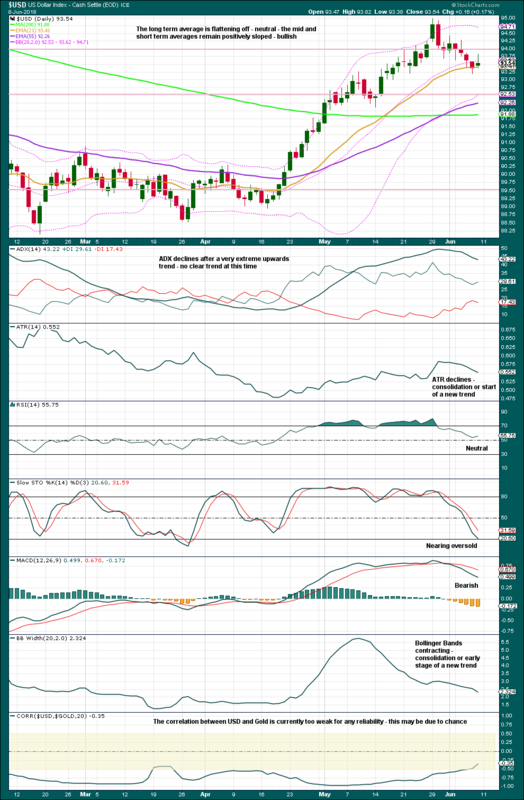 While price remains below the upper edge of the best fit channel, expect bounces to find resistance there. On the other side of the channel, the lower edge should be breached by the strength of one of the ends of any one of the third waves which are unfolding. It is also still just possible that the rise for Bitcoin is not over. 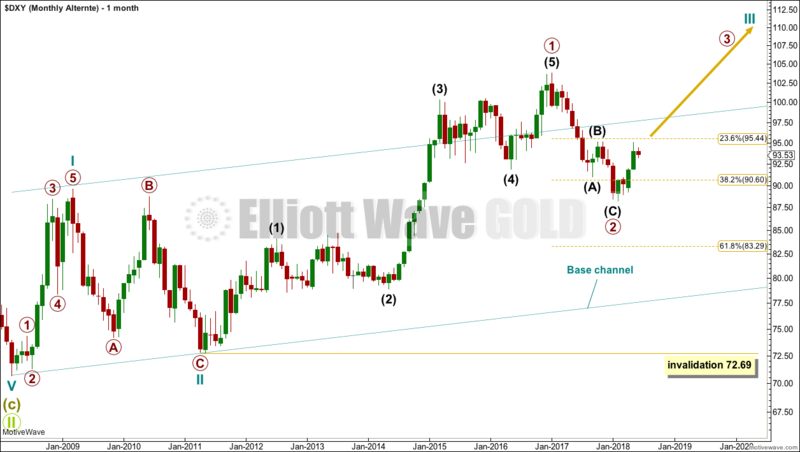 The last blow off top may have only been the end of a third wave, so a still stronger fifth wave may be yet to come. 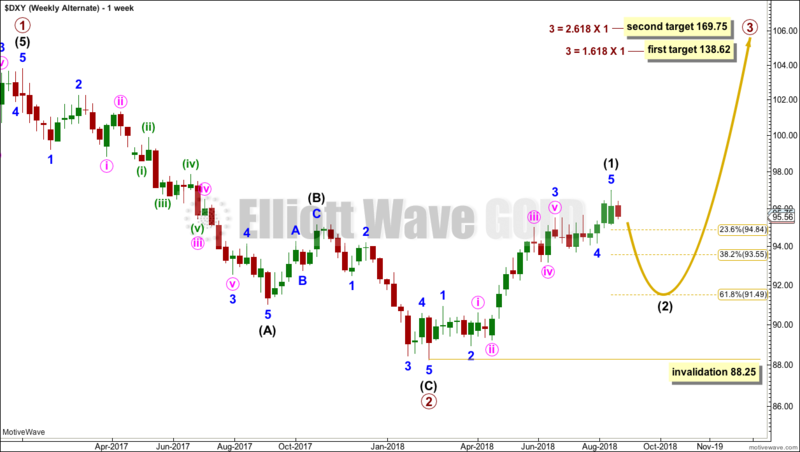 Primary wave 4 may not move into primary wave 1 price territory below 492.80, but this price point is far away for any usefulness. 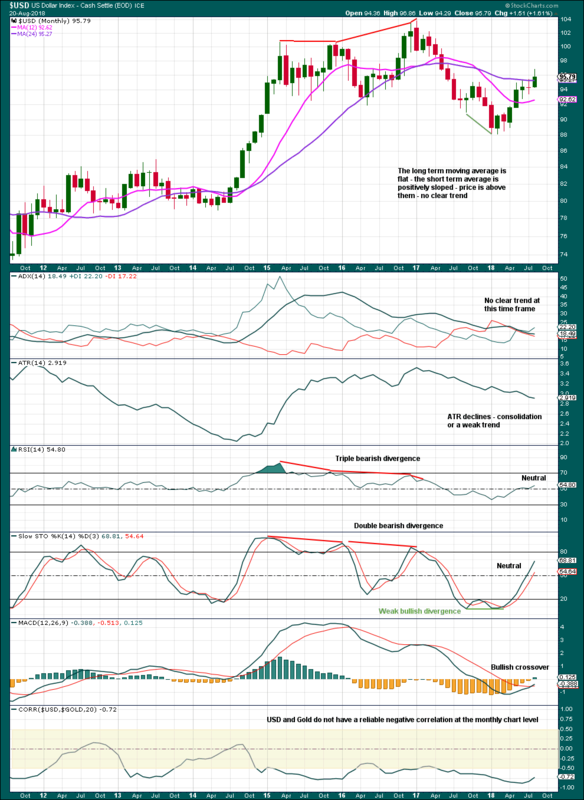 The Forever trend line is now very clearly breached by three full weekly candlesticks below and not touching it. This may be a relatively early indication that this bullish wave count may be wrong. The probability of it is reduced, so it should be discarded. 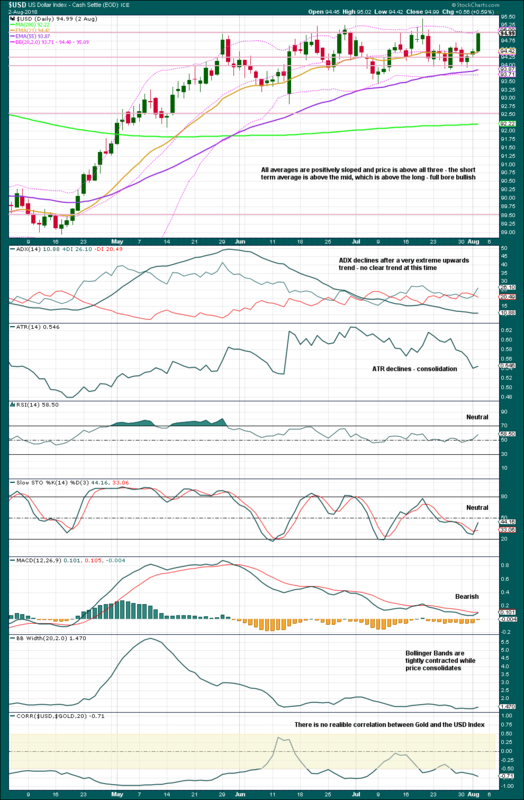 Using ADX as a trend indicator, at this time it indicates a very extreme downwards trend, which can continue further. Bitcoin can sustain very extreme trends for very long periods of time. Published @ 04:37 a.m. EST. Last analysis in March expected upwards movement towards 97.97. 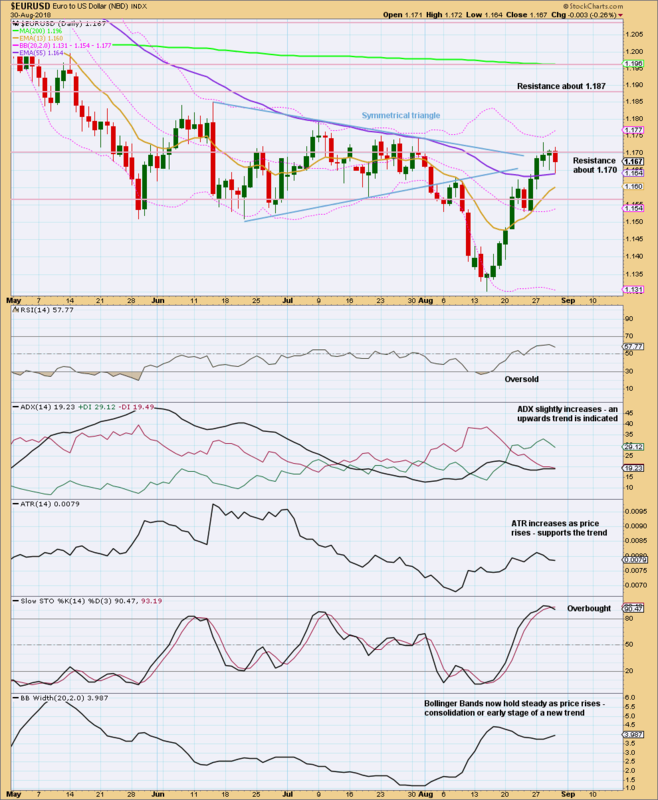 Price has thus far continued to move higher, up to 95.02. A five down may be complete within the new trend. A three up now looks complete. This may be primary wave A within a flat correction, or primary wave W within a double zigzag or double combination. A flat correction would require primary wave B to retrace a minimum 0.9 length of primary wave A at 88.93. 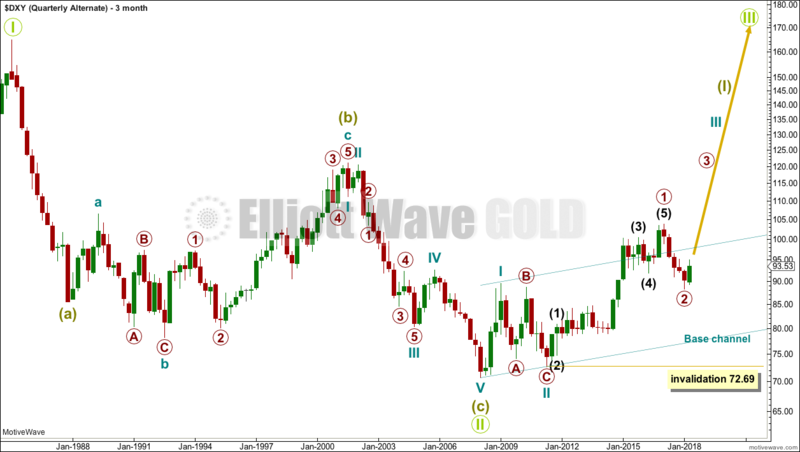 Within a flat, primary wave B may make a new extreme beyond the start of primary wave A at 88.25. 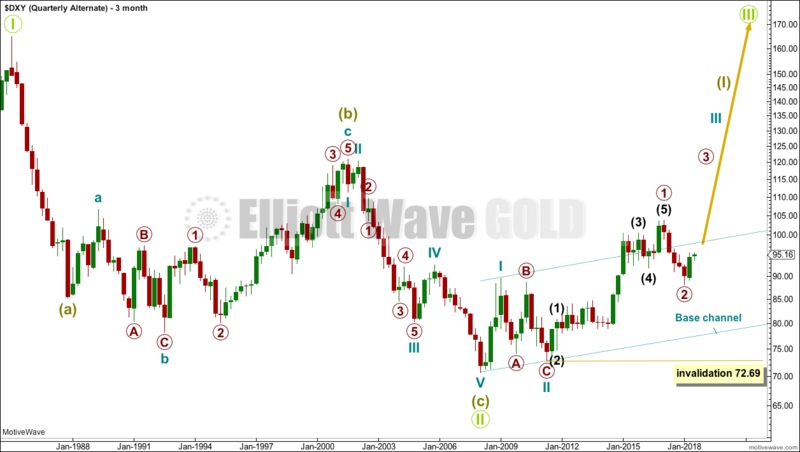 A double zigzag would expect a relatively brief and shallow correction for primary wave X. A double combination would expect a relatively deep and possibly time consuming correction for primary wave X. This analysis is published @ 11:02 p.m. EST. 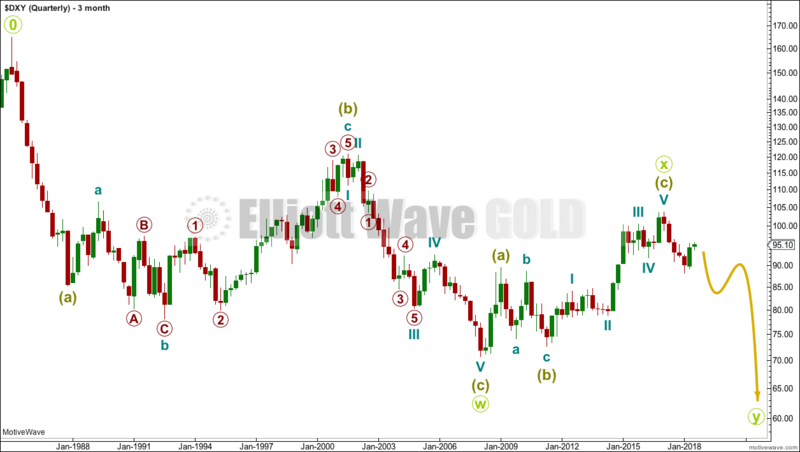 This analysis was previously posted on Elliott Wave Stock Market.